Spring Hill is an inner suburb of Brisbane, Queensland, Australia located 2 kilometres (1.2 mi) north of the central business district. Parts of Spring Hill can be considered to be extensions of the Brisbane CBD. In the 2011 census, Spring Hill had a population of 5,259 people, 44% female and 56% male. The median age of the Spring Hill population was 30 years, 7 years below the Australian median. Children aged under 15 years made up 6.8% of the population and people aged 65 years and over made up 5.6% of the population. The most notable difference was the group in their twenties; in Spring Hill this group made up 36.1% of the population, compared to just 13.8% nationally. 43.8% of people living in Spring Hill were born in Australia, compared to the national average of 69.8%; the next most common countries of birth were Korea, Republic of 3.9%, India 3.8%, New Zealand 3.6%, England 3.5%, Colombia 2.1%. 56.7% of people spoke only English at home; the next most popular languages were 3.3% Korean, 3.3% Mandarin, 3.3% Spanish, 1.7% Portuguese, 1.7% Cantonese. The most common religious affiliation was "No Religion" (28.5%); the next most common responses were Catholic 22.9%, Anglican 8.4%, Hinduism 3.7% and Buddhism 3.1%. Spring Hill is serviced by a number of schools, including Brisbane Grammar School, Brisbane Girls Grammar School, St James College, Brisbane St Joseph's College, Gregory Terrace and Brisbane Central State School. Those in the surrounding suburbs including the Petrie Terrace State School in Paddington and the Albert Park Flexi School in Petrie Terrace. Spring Hill was so named in the nineteenth century because the hill on which the suburb was built was the source of the creek that was Brisbane's first fresh water supply. Boundary Streets in both Spring Hill and West End were named due to the racist policy of separating European arrivals from the Jagera and Turrbal peoples. Spring Hill is one of the oldest residential neighbourhoods in Brisbane, with many houses dating from the nineteenth century. As an example, some of the house lots in Sedgebrook Street were surveyed in the 1870s. However, in recent decades much of the older residential and commercial structures have been demolished to be replaced by modern office blocks and apartment buildings. A government laboratory and animal facility was built in the 1890s adjacent to the Brisbane Grammar School on College Rd. It was known as the Bacteriological Institute from 1900 to 1910. Between 1903 and 1947 trams ran up Edward Street and along Leichhardt Street to Gregory Terrace. This tram line, operated by the Brisbane City Council, was the steepest in Australia, with a maximum gradient of 1 in 8. After its closure the trams were initially replaced with diesel buses, but in 1951 these were replaced by a trolley-bus service. This was in turn replaced by diesel buses in 1968. The Brisbane City Council continues to provide bus services to the suburb. The suburb was also served by trams along Boundary street and St Pauls Terrace, with this service being replaced by buses in 1969. The Inner-Northern Busway serves the suburb via the Normanby bus stop. The Old Windmill in Wickham Park was built in 1824 when Brisbane was a penal colony and originally milled grain and then used as a gallows for the colony. The Spring Hill Baths operated by the Brisbane City Council are the oldest public baths in Queensland. 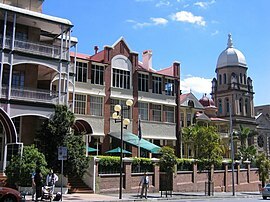 The Brisbane City Night branch of the Queensland Country Women's Association meets at the International Hotel at 525 Boundary Street. ^ a b Australian Bureau of Statistics (27 June 2017). 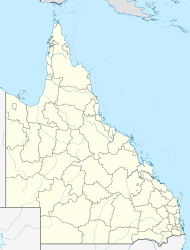 "Spring Hill (Qld)". 2016 Census QuickStats. Retrieved 12 August 2014. ^ "Central Ward". Brisbane City Council. Brisbane City Council. Retrieved 4 March 2017. ^ Cameron Atfield (1 February 2016). "Brisbane could rename historically racist Boundary streets". The Brisbane Times. Fairfax Media. Retrieved 30 August 2017. ^ "McWhinneys Brick Cottage (entry 602248)". Queensland Heritage Register. Queensland Heritage Council. Retrieved 19 June 2013. ^ "Lonsdale House (entry 601159)". Queensland Heritage Register. Queensland Heritage Council. Retrieved 19 June 2013. ^ "Department of Main Roads Building (former) (entry 602830)". Queensland Heritage Register. Queensland Heritage Council. Retrieved 25 November 2014. ^ "19 Gloucester Street (entry 600308)". Queensland Heritage Register. Queensland Heritage Council. Retrieved 19 June 2013. ^ "Cliveden Mansions (entry 602186)". Queensland Heritage Register. Queensland Heritage Council. Retrieved 19 June 2013. ^ "Brisbane Grammar School (entry 600124)". Queensland Heritage Register. Queensland Heritage Council. Retrieved 19 June 2013. ^ "Victoria Flats (entry 601888)". Queensland Heritage Register. Queensland Heritage Council. Retrieved 19 June 2013. ^ "Centenary Pool Complex (entry 601240)". Queensland Heritage Register. Queensland Heritage Council. Retrieved 19 June 2013. ^ "Grangehill (entry 601668)". Queensland Heritage Register. Queensland Heritage Council. Retrieved 19 June 2013. ^ "Victoria Park (entry 602493)". Queensland Heritage Register. Queensland Heritage Council. Retrieved 19 June 2013. ^ "Mountview House (entry 602317)". Queensland Heritage Register. Queensland Heritage Council. Retrieved 19 June 2013. ^ "Bedford Playground (entry 601786)". Queensland Heritage Register. Queensland Heritage Council. Retrieved 19 June 2013. ^ "Brisbane Central State School (entry 600312)". Queensland Heritage Register. Queensland Heritage Council. Retrieved 19 June 2013. ^ "St Pauls Presbyterian Church (entry 600309)". Queensland Heritage Register. Queensland Heritage Council. Retrieved 19 June 2013. ^ "St Pauls Presbyterian Church Hall (entry 600310)". Queensland Heritage Register. Queensland Heritage Council. Retrieved 19 June 2013. ^ "Bellmount (entry 600311)". Queensland Heritage Register. Queensland Heritage Council. Retrieved 19 June 2013. ^ "Monier Ventilation Shaft 2 (Spring Hill) (entry 602067)". Queensland Heritage Register. Queensland Heritage Council. Retrieved 19 June 2013. ^ "Spring Hill Baths (entry 600313)". Queensland Heritage Register. Queensland Heritage Council. Retrieved 19 June 2013. ^ "Moody's Cottages (entry 600314)". Queensland Heritage Register. Queensland Heritage Council. Retrieved 19 June 2013. ^ "Albert Park (North) air raid shelter (entry 602473)". Queensland Heritage Register. Queensland Heritage Council. Retrieved 19 June 2013. ^ "All Saints Anglican Church (entry 600168)". Queensland Heritage Register. Queensland Heritage Council. Retrieved 19 June 2013. ^ "Inchcolm (entry 600170)". Queensland Heritage Register. Queensland Heritage Council. Retrieved 19 June 2013. ^ "Lister House (entry 600171)". Queensland Heritage Register. Queensland Heritage Council. Retrieved 19 June 2013. ^ "Ritas at Dods House Restaurant (entry 600172)". Queensland Heritage Register. Queensland Heritage Council. Retrieved 19 June 2013. ^ "Ballow Chambers (entry 600164)". Queensland Heritage Register. Queensland Heritage Council. Retrieved 19 June 2013. ^ "Brisbane City Council Carpark (entry 601511)". Queensland Heritage Register. Queensland Heritage Council. Retrieved 19 June 2013. ^ "Wickham House (entry 601180)". Queensland Heritage Register. Queensland Heritage Council. Retrieved 19 June 2013. ^ "Baptist City Tabernacle (entry 600175)". Queensland Heritage Register. Queensland Heritage Council. Retrieved 19 June 2013. ^ "United Service Club Premises (entry 601776)". Queensland Heritage Register. Queensland Heritage Council. Retrieved 19 June 2013. ^ "Craigston (entry 600165)". Queensland Heritage Register. Queensland Heritage Council. Retrieved 19 June 2013. ^ "Bryntirion (entry 600166)". Queensland Heritage Register. Queensland Heritage Council. Retrieved 19 June 2013. ^ "Athol Place (entry 600167)". Queensland Heritage Register. Queensland Heritage Council. Retrieved 19 June 2013. ^ "Theosophical Society Building (entry 600169)". Queensland Heritage Register. Queensland Heritage Council. Retrieved 19 June 2013. ^ "St Andrews War Memorial Hospital Administration Building (entry 602170)". Queensland Heritage Register. Queensland Heritage Council. Retrieved 19 June 2013. ^ "Lady Bowen Hospital Complex (former) (entry 601798)". Queensland Heritage Register. Queensland Heritage Council. Retrieved 19 June 2013. ^ "Monier Ventilation Shaft 1 (Spring Hill) (entry 601995)". Queensland Heritage Register. Queensland Heritage Council. Retrieved 19 June 2013.